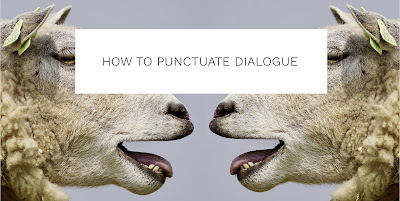 I usually don't do posts on punctuation, because I figure it's something that anyone can simply look up, but lately I've been running into quite a bit of dialogue that has been punctuated improperly, which is really no surprise, because when you are learning to write dialogue, punctuating is super confusing. Let's start with the most basic and then move on to the most complicated. 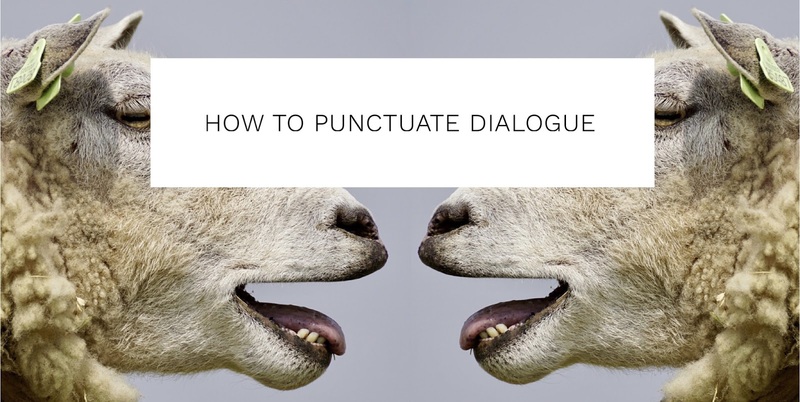 Dialogue is usually made of two parts: the dialogue, and the dialogue tag. The dialogue tag tells us who said it and (sometimes) how. Sometimes dialogue will have no tags because who is saying it is implied. This is the easiest type to punctuate. - Simply put whatever is said in quotations. "First I want to go biking. After that, let's go fishing. If we have time still, let's go hiking." *Note: Inside the quotations, always treat capitalization like you would normally. This is the next simplest. - If you end the dialogue with a complete sentence that would ordinarily end in a period, put a comma instead, then the dialogue tag, then the period. "I'm setting up an aquarium," Jen said. "Can you pick up some eggs? I have to bake cookies for the fundraiser," Pat said. "Shut up! I can't listen to you for another second," Steve yelled. *Note: If you are ending the dialogue on an intentional sentence fragment, you would do the same thing. "There were bears. Huge bears," Tanner explained. "No one can stand her. Ugly. Mean. A monster," he said. "Bears. Beets. Battlestar Galactica," he said. - Put the question mark inside the quotation, then the dialogue tag. "Did he love you?" her father asked. "Would Wednesday work for the meeting?" she asked. "It's my sister's birthday this Saturday. Do you want to come to the party?" Emma said. - Put the exclamation point inside the quotation, then the dialogue tag. "I hate you!" Carry said. "Shut up! Shut up!" Sean yelled. "Someone's hurt. Hurry!" she said. This is done more rarely, but here is how you would punctuate it. - Use a comma between the tag and the dialogue. End the dialogue punctuating how you would normally. Timmy asked, "Will it hurt?" Mom said, "I've already cleaned the entire house." Dad said, "Don't back talk me!" She said, "I don't have a lot of time. Could we reschedule?" *Note the slight difference in "sound" and beat when the dialogue tag comes first. *Note that since the dialogue tag starts the sentence, the first letter will always be capitalized (She said, He said, Her mom said, Timmy said, The man said). - Punctuate it according to the second section, then start the next line of dialogue, punctuating it like the first section. "I'm so cold," Rupert complained. "I can't wait for summer." "What's your favorite color?" her sister asked. "I like blue." "I love him!" she said. "You can't change my mind!" "Bears. Beets," Jim said. "Battlestar Galactica." - Alternatively, the middle tag can be attached to the next sentence. "I'm so cold." Rupert said, "I can't wait for summer." "What's your favorite color?" Her sister said, "I like blue." "I love him!" She said, "You can't change my mind!" "I'm so cold." / Rupert said, "I can't wait for summer." "I'm so cold," Rupert said. / "I can't wait for summer." *Watch out for attaching the tag to the wrong sentence. Wrong: "What's your favorite color?" Her sister asked, "I like blue." "I like blue" can't be "asked." It's not a question. Correct: "What's your favorite color?" Her sister said, "I like blue." Maybe you want the tag coming in the middle of a dialogue sentence. - Use commas to separate the tag from the spoken dialogue. "All I was wondering," she said, "was if you were going to the party." "He always lies, cheats," Tiff said, "and steals!" "After practice," her dad said, "let's get ice cream." *Notice that having the tag split a sentence alters the beat with an extra pause. This can sometimes be used to convey hesitancy (perhaps in the first example) or emphasis (in the second example). "All I was wondering was if you were going to the party." "He always lies, cheats, and steals." "After practice, let's get ice cream." So you should not tag them as if they are complete sentences. "All I was wondering," she said. "Was if you were going to the party." "He always lies, cheats." Tiff said, "And steals!" "After practice," her dad said. "Let's get ice cream." Always look at the sentence(s) in the dialogue and where you are placing the tag to determine how to punctuate them. You can often imply the speaker with action. Keep in mind that this is implying NOT tagging. - The action and the dialogue are two separate things, so they should be punctuated as two separate things. Punctuate the dialogue as if there is no tag. Write the character's action as you normally would. "Do you need help?" he smiled. "Hurry up," Nick opened the door. She closed the envelope, "It's the only letter he wrote me." "I'm exhausted," she put on her pajamas, "I want to sleep a full week." These aren't tags because they do not "speak." You cannot "smile" a spoken sentence. You can smile while speaking a sentence, but you cannot smile a spoken sentence. Alternatively, you can attach the action to a tag, using both a tag and an action. For more advanced tips on this, you can see my post "5 Most Common Mistakes with Dialogue." Sometimes you may want action to come in the middle of a dialogue sentence. But here's the problem. It's not a dialogue tag. - Use em dashes to set off the action outside of the quotes. Don't use commas within the quotes near the interruption. "You said"--she wrenched open the car door--"that she would be safe!" "Next time you go blabbing about our secrets"--he kicked a rock--"you'll be put in isolation." - Every time there is a new speaker, start a new paragraph. "You said they would be safe," Lance said. "You said you could defend them!" "I thought I could! But I didn't know they could wield magic," Ellie said. "They were our last hope." "At least I tried to help. Some people around here have done nothing," she said pointedly. - If one speaker is speaking for multiple paragraphs, delete the closing quote of their previous paragraph and start the next with another quotation mark. It feels counterintuitive, but that's the rule. Lance glared."Nothing?" he asked. "You think I've done nothing? I guess I haven't then. "I guess getting intel from the enemies was nothing. "I guess locating the chosen ones was nothing. "I guess sacrificing time that could be spent with my own children is nothing. "You had one job to do. "But maybe to you, it was nothing." Typically writers reserve this sort of thing for long paragraphs but my example still proves the point. At some point you'll probably have internal dialogue (or maybe better put . . . monologue), or in other words, your character's direct thoughts. - Never put these in quotes. Not double quotes. Not single quotes. Since they aren't being spoken, they should be in italics (in some styles, this is underlined, but you can almost never go wrong with italics). However, handle tags the same way you would in spoken dialogue. I can't believe she did that to me, George thought. I can't do this anymore! Monica thought. Please, please let this work, Jasper silently prayed. I can't mess this up again. If I see him at school tomorrow, she thought, then I will confront him. In some speculative fiction, you may have characters who can communicate via thoughts. These should also be in italics, not quotes. There is danger out there, Saphira thought to him. Don't worry. I'll be careful. Eragon strapped on his boots. If you have any dialogue questions, feel free to ask. Hey, glad it is helpful! One of the reasons I wrote it is so I can send writers to it as well when editing. It can be a pain to explain quickly (and confusing to the writer to try to, if they really don't know). I remember struggling with it long ago myself. Now I don't even have to stop and think. Hopefully this will help anyone get to that point too! Was about to head to bed when your post caught my eye. Only writers would stay up late to read an article on punctuation! XD probably true! Thanks for visiting! Thank you so much for this extensive coverage. I saw this and made all of my authors read it. They grumbled and grumped, but only because your article validates everything I have been telling them about punctuating dialogue. Thanks! You're welcome! Thanks for visiting.